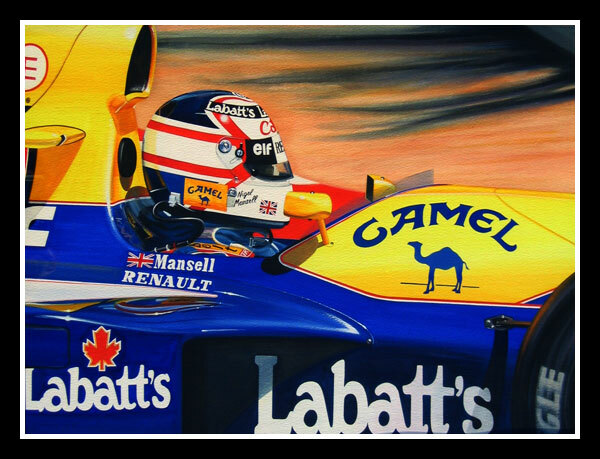 Nigel Mansell was born in Upton-on-Severn on 8 August 1954. It was with the help of father Eric that Mansell took his first steps into motor racing. Originally, he worked at Lucas Aerospace before taking up karts and with encouragement from his father, he moved up into Formula Fords, winning his first event. Later that same year, 1976, Mansell broke his neck at Brands Hatch. The medical experts said his racing career was over, but Mansell thought differently. He progressed into F3, where he had to sell his house, take out a large overdraft and with the support of his wife Rosanne, write letters to potential sponsors, all to get a few races. Success had to come with debts and promises hanging over them and in 1979 the big break came. Despite a crushed vertebra from a recent race, Mansell responded to a call from Colin Chapman to test a Lotus F1. The doctors told him to rest his back for two or three months, but Mansell had given it only a week. His decision paid off and he impressed Chapman, who offered him a testing contract. His engineering background helped the mechanics, and it was not long before Mansell started his first Grand Prix, although it resulted in first degree burns when petrol was spilt on him before the race. In 1984 he joined Williams and by the following year he had won his first Grand Prix in front of a patriotic crowd at Brands Hatch. He would dominate racing in Britain and attracted a fanatical army of spectators, but the world championship eluded him. Spectacular tyre failure in Australia in 1986 and a crash in Japan the following year ended his hopes in the 1980s. Finally, in 1992, after a record nine wins in a season, he achieved his ambition. He moved to Indy cars in 1993, promptly winning that title, becoming the first man to win both the F1 World Championship and the Indy car titles in successive seasons. But his return to Grand Prix racing was not as successful, retiring after only a few races in a McLaren in 1995.